In some preparations for food products containing eggs, some specific enzymes are added in order to free the fatty acids. The Total Acidity test allows to check the total quantity of acidity and to monitor the enzymatic reaction. CDR FoodLab® simplifies and speeds up the traditionally used procedures, enabling to perform many analyses in few time and with small quantities of sample as is. The Acidity of the sample (with pH 7,0) react with a chromogenic compound and decrease the color. The optical density, measured at 630nm, is proportional to the concentration of Free Fatty Acids in the sample. 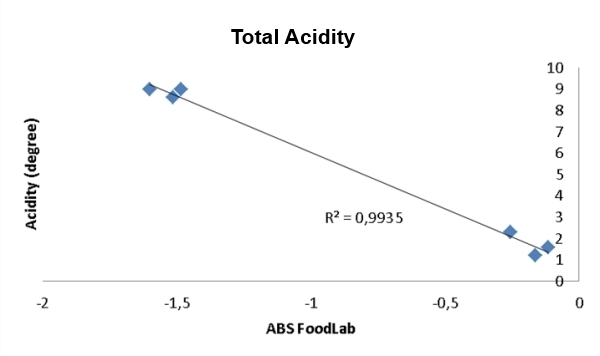 CDR FoodLab® method shows a very good correlation with the reference method. Powder egg: dissolve 1 part of egg in 3 parts of water and homogenize the solution. Liquid egg: use sample as is. Total Acidity was last modified: December 30th, 2018 by CDR s.r.l.